What makes the scene so inviting? The gently curving path, designed to invite you to stroll among the plants, leads to a small circular patio, and the color scheme for the plants on either side is both fresh and lively. Drifts of chartreuse euphorbias repeat throughout the borders, while clusters of blue and white flowers add accents. 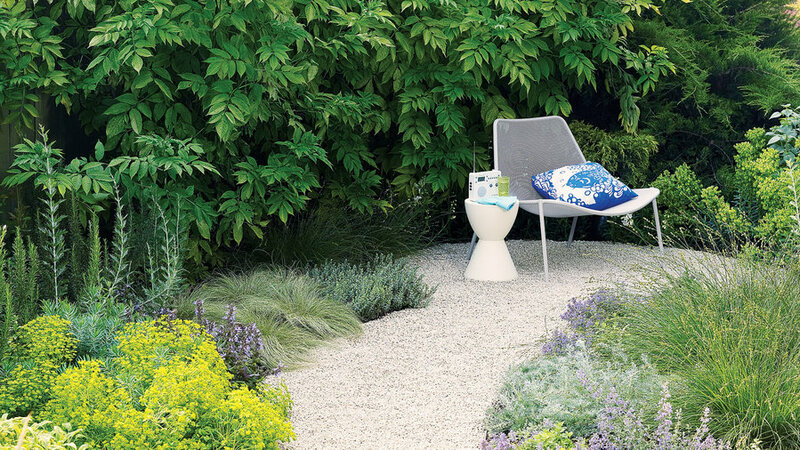 Soft grasses, aromatic herbs, and silvery foliage fill in between them, softening the path’s edges. Shape: Unless your path is in a formal garden, a curve will look more inviting. Destination: Enlarge the path’s end to accommodate a chair and a small tea table, a bench, or even a birdbath. Fringe: For a natural look, make the path 40 inches wide, and plant groundcovers densely (1 foot or less from benderboard) to cascade over its edges. Fragrance: Plant aromatic herbs or perfumed flowers along the path to sweeten the journey.